Got a question or story about climbing Mt. Shirouma-dake? Click here to ask or share it at the bottom of the page! Despite being a relatively easy climb, Mt. Shirouma-dake (白馬岳) (Japanese for "White Horse Mountain") is without question one of Japan's most dangerous peaks, claiming lives just about every year. 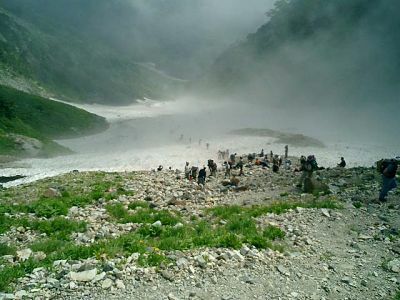 In fact, on Aug. 27, 2006, the very next day after I hiked up the Daisekkei Valley (大雪渓) (big snow valley), a lady died there after being struck by a huge, 1-meter wide boulder that tumbled down out of nowhere in foggy conditions with severely restricted visibility. The above researchers in their Nov. 2006 report recommended fundamental improvements in the education system for climbers, including proposing a map identifying the most hazardous areas. And to put in MY 2 cents worth, I've compiled a short list of news stories about Mt. Shirouma-dake mountain climbing accidents which have occurred in recent years. Be careful! From the Sarukura trailhead (elev. 1250m) to the summit, it took me almost 7 hrs., including about an hour and 15 minutes to trek across the Daisekkei Valley (大雪渓) (my Mt. Shirouma-dake trip schedule). Since the big snow valley can be a bit slippery in places, especially early in the morning, crampons are recommended and I rented mine for 700 yen at a little shop just outside of Hakuba Station. 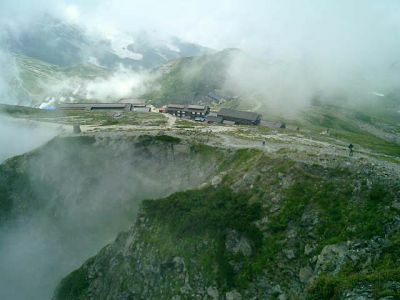 Near the summit, you have a choice of 2 mountain huts, one sleeping 1000 and the other one, Hakuba-sanso (白馬山荘), sleeping a remarkable 1500. I chose the smaller (and lower elevation) one, Chojo Shukusha (頂上宿舎). 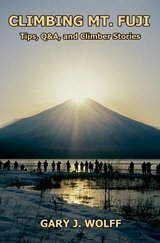 After scaling Japan's 32nd tallest peak, Mt. Shirouma-yari-ga-take (白 馬鑓ヶ岳, elev. 2903m), a real treat on the way back down to Sarukura was the open-air Yari Onsen (hot spring), which was right on the hiking trail and only cost 300 yen (my trip expenses). To be honest, the water was a tad too hot for me, especially on my sunburn from the day before (I was hiking in shorts and forgot my sunscreen), but a hot spring bath on a hiking trail in Japan is an extreme rarity. 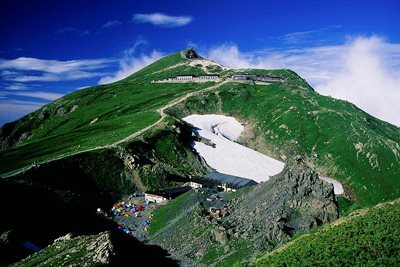 White Horse Mountain is arguably one of the most accessible of Japan's highest mountains. I left Shinjuku Station in Tokyo at 9 pm on Friday night Aug. 25, 2006 and was back home by 9:30 on Sunday night. But I did receive a very kind favor from a nice man who drove out of his way to give me a lift from Matsumoto to Hakuba. Koichi-san is an Azumino City-based mechanical engineer who designs Sony Vaio notebook computers. I hope you'll have time to check out my Flickr photo album linked below of this fabulous mountain climbing trip. Enjoy!! You can view here at Flickr all of my pics of Mt. Shirouma-dake (白 馬岳), elev. 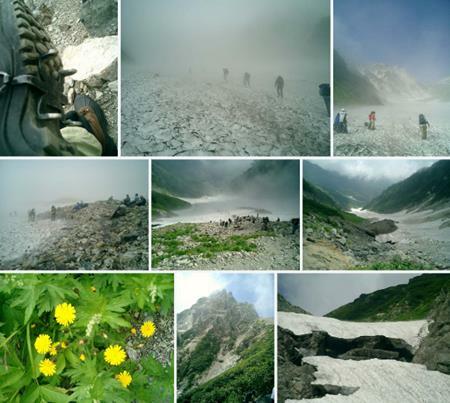 2932m, Japan's 26th highest peak, taken Aug. 25-27, 2006, or click on the photo collage below. You can view all of my Mt. Shirouma-dake pics at a glance here. In Oct. 2009 I created the customized map below, as I thought it'd be cool to see all of Japan's 25 highest mountains at a glance. Although Mt. Shirouma-dake is not among Japan's 25 highest peaks, you can still see it in the map below, located about 25 km northeast of Mt. Tateyama, Japan's 20th highest peak. 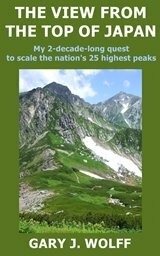 If you're thinking of doing this climb, I suggest you pick up a copy of Hiking in Japan by the Lonely Planet, which was just updated in Aug. 2009. I own the 2001 edition and it has a nice 5-page write-up of Mt. Shirouma-dake (白馬岳), complete with access info, a small trail map, route description, and even phone numbers for the mountain huts. Also, if you have any time to kill before or after your Mt. Shirouma-dake hike, you might want to take some time to explore the Hakuba area, the venue for many of the skiing events at the 1998 Nagano Winter Olympics. 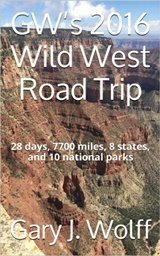 This page at Trip Advisor shows a lot of the fun stuff to do, as well as places to stay in the area. Please stop by again soon, as I intend to update this page periodically with more details in the future, and if you have any questions or comments, feel free to use the section below. Or if you prefer sending me a private message, just click on "Contact Me." And if you've already climbed Mt. Shirouma-dake (白馬岳) and you'd care to share your climbing story and pics with other climbers, feel free to do so in the section below. Have a Question or Story about Climbing Mt. Shirouma-dake? Do you have a question or a story about climbing Mt. Shirouma-dake? Please pay it forward and share your climbing experience (along with up to 4 pics) with other visitors to this page still planning their Mt. Shirouma-dake hike! Unlike social media sites like Facebook & Twitter where your post quickly gets pushed down off the page, your story here will be given a dedicated webpage and its own URL, giving others a chance to comment (see below other climbing Mt. Shirouma-dake stories submitted so far). And feel free to link your story back to your webpage, blog, or any other page of your choosing. Can you help me find a mountain I climbed many years ago?